The first impression of Atlantis on The Palm is akin to a megawatt 1000 power bulb whose blinding beam continues to grow bigger and bigger as you get closer to the precincts of one of Dubai’s most opulent playgrounds. 1. The expansive lobby, dominated by Dale Chilhuy’s 9.75 metre glass sculpture, a series of hand- painted murals, eight ‘fish scale’ patterned columns and an aquatic piece de resistance, resounds with nonstop human footfalls and murmurs. 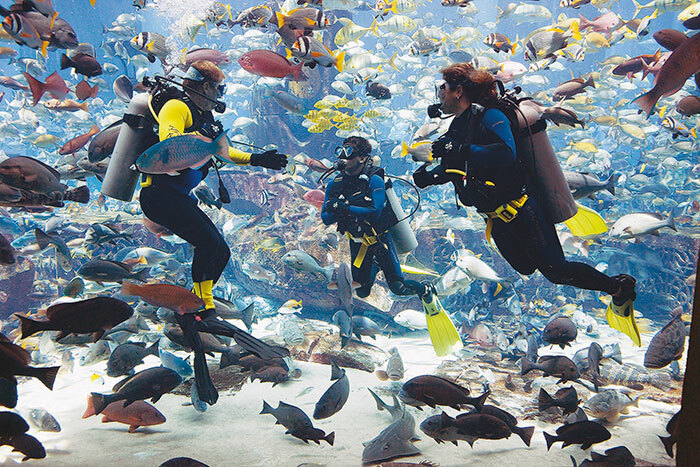 The open-air, wall-to-wall, floor-to-ceiling aquarium keeps most visitors mesmerised and completely occupied with their cameras, as they click dozens of selfies with formidable species of marine life. In some of the grand suites, the walls of the bathrooms are parts of the aquarium! 2. The ocean-themed resort, besides boasting fistfuls of varied entertainment also houses the Aquaventure Waterpark that offers hair-raising waterslides, river rides in the rapids and fascinating dolphin encounters. 3. In the Lost Chambers, lose yourself in a maze of tunnels and dimly-lit passages as you explore the mythical world of the inhabitants of the Arabian Sea – the pencil urchins, horseshoe crabs, moon jellyfish and more. 4. The hotel even runs a special fish hospital in its premises for those who are injured or ill. If your appetite for the exoticness of the marine world is still not quite satiated, stop for an extravagant high tea at the unique underwater setting of Ossiano. Sip on a delicate English brew as you nibble on lobster éclairs, saffron pancakes and chocolate-rolled dates, to the cheery sounds of an acoustic guitarist, all the while absorbing the tranquil swishing of the aquamarine waters around you. 5. Atlantis is served by a mind-boggling variety of cuisine choices and restaurants, among them the famed Nobu and Ronda Locatelli. Chef Giorgio Locatelli has imbued the latter with his signature culinary skills, bringing all the goodness of classic Italian fare to your plate. 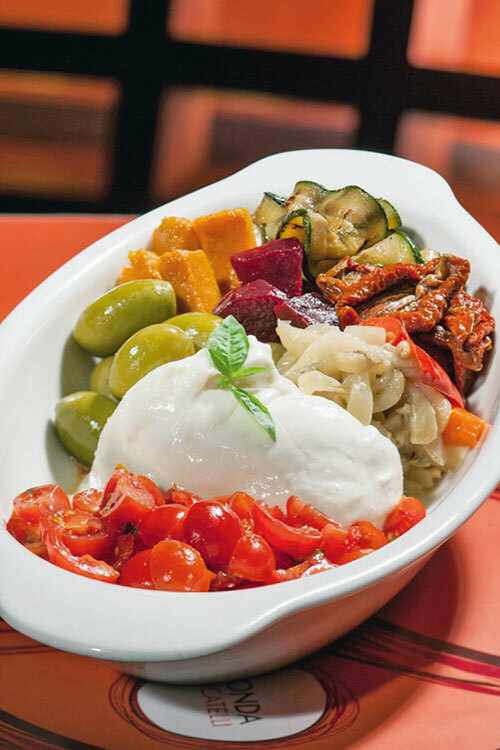 Begin with polpette (meat balls and cheese) and burrata with tomato and basil. Move on to a main course ranging from homemade ravioli or tagliatelle to a braised rump of lamb or the house specialty, the beef lasagne. Top up with a crema catalana and prep yourself for an hour at the spa. 6. A gentle gurgle of water greets you at the 2400 square metre ShuiQi Spa which houses 27 treatment rooms and aromatic relaxation therapies. Opt for a de-stress essential oil and muscle gel that are massaged into your limbs till you feel yourself going limp. After a replenishing cup of ginger tea and armed with a basketful of fragrant bath oils for personal home rituals in the future, walk past the energising shopping arcade and the glittering lobby to face the sun beating down across the shimmery ocean beyond. 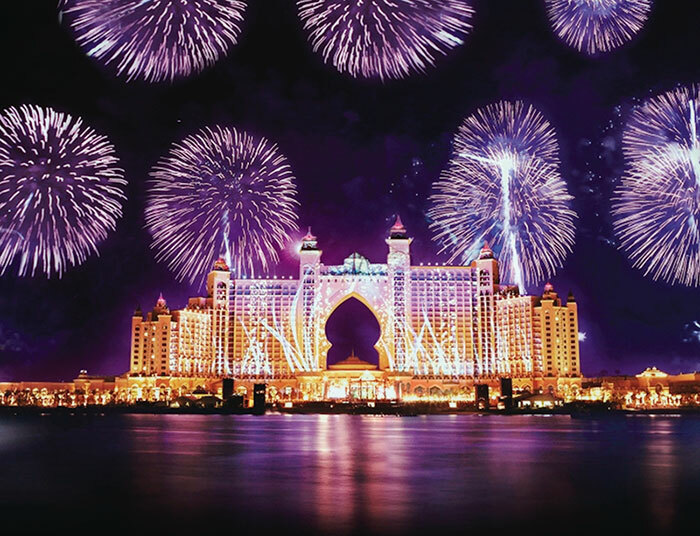 It is no wonder then that Farah Khan swooped onto this spectacular location for her last blockbuster Happy New Year!